Being a daughter, mother, sister, wife and so many roles associated with feminism is a job to do. The roles come with not just responsibilities, but also great sacrifices, difficulties and expectations. Dealing and balancing equations related to life as girls isn’t a cake walk. Menstruation or the monthly cycle makes things a little crankier and fatigueful. Thanks to technology and inventions that we are not limited to pieces of cloth for our menstrual hygiene. Sanitary napkins could be the second name for saviors as they let us going through those tough days of the month. Whisper has been the most trusted sanitary napkin brand for decades by now. 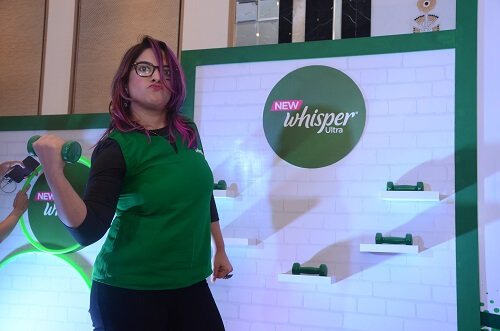 With the motive to help women achieve heights of success, Whisper India has launched The New Whisper Ultra Pads. Whisper strives to break the barriers that obstacle anything that rests back because of menstrual reasons with the campaign #OwnThose5Days! I was really excited to be a part of this phenomenal bloggers meet which happened on 19th December 2015 at Palladium/St. Regis Hotel, Mumbai. The surprising part about the hangout is that it was the first ever exclusive campaign in the Country by the brand line. 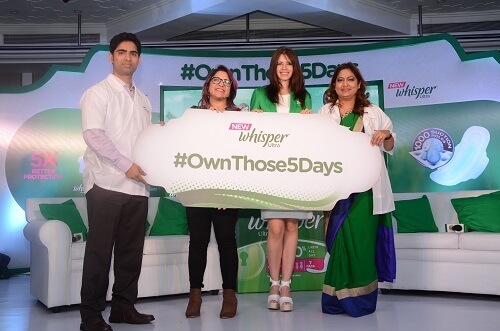 Bollywood actress Kalki Koechlin, Gynecologist Dr. Nandita Palshetkar, Whisper R&D Expert Chetan Kotyalkar and stand-up comedian Aditi Mittal supported the brand to bring to the life need to break taboos and the importance of hygiene. Whisper panel of experts demonstrated effectiveness of the new product with not just interactive activities and conversations but also by showcasing how all the liquid gets absorbed by the magic crystals, on turning the glass; the liquid did not drip. Kalki, the brand ambassador shared her views, personal experiences and opinions about the revolutionary sanitary napkin by the world’s most trusted brand for women to be virtually unstoppable. Dr Nandita briefed about the dos and don’ts explaining menstrual process with her expertise. From her words of wisdom, she narrated about the main reasons of bloating during periods are salt and caffeine. Also, strangled taboos associated with periods like avoiding exercises, not wearing whites, staying at home during those days. In fact, light exercises and adequate rest are few things that need to be followed. This has been the most educative session that debunked myths to let women own those 5 days. Personally I loved this session a lot. Comedian Aditi made the ambience lively with her hilarious traits even on such a sensitive subject as she talked about taboos wittily. The R&D Expert Chetan demonstrated uniqueness of new whisper ultra that offers better protection for longer hours with 1000 suction holes. The presentation clearly shows how they have made efforts towards making Whisper better than ever. To get more updates about the event, you can check out the official Instagram page of Whisper India.